This morning I woke up before everyone else and (honestly) my first thought was: Donut Day! I had planned on keeping today as a “Celebration Day” of no restrictions even though it wasn’t a birthday party, national holiday, or full moon. It was more of a Celebration Day for the past year. Only as I started to think about it… having a hamburger, maybe some cake or ice cream, a pepperoni pizza for dinner… I realized, that I actually didn’t even want those things today. Well, wait… I wanted them but I more so wanted to keep my jeans fitting. And I realized that I would have plenty more opportunities for all of those things… so it wasn’t so vital for me to have them today. I have certainly learned over the past year that cravings come and go. That I don’t have to give in to them. That I can just eat to live. But…… I still wanted that donut. 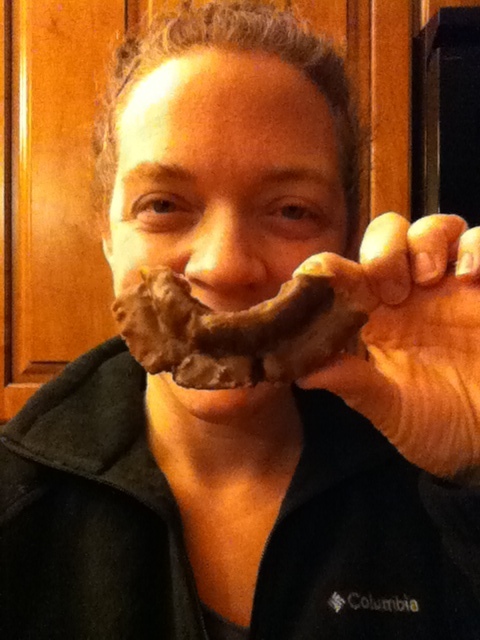 There were several donuts leftover from the bunch that my father-in-law brought over yesterday (see my post Day 357: First Donuts for that story), and there was a half of one of them that is my favorite: a chocolate covered “tractor wheel”, as we call it (I think our donut shop labels them as sour cream). And so I didn’t wake anyone up… cause I was remembering my cookie dough incident that I wrote about on Day Twenty-One… this whole thing started with just me and God. alone. Well… I guess it was me and God and a huge vat of cookie dough. Anyway, I just thought it was appropriate that it be just me and God and the sugar once again. 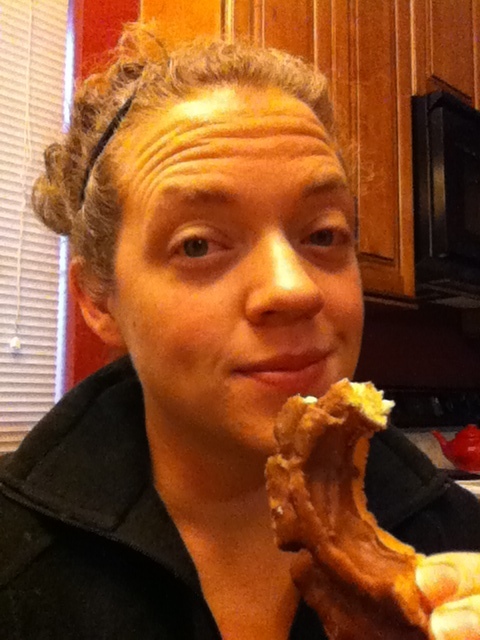 And it was a beautiful experience… eating that half-donut. And not because it was so amazingly good (although it WAS good), but because of the celebration in my heart and the thanks to God for bringing me to this point… to the point where eating a donut was a big deal instead of just another regular ol’ day of gluttony. And after I finished the donut… it was just… over. I poured myself a cup of coffee and went on my way with the day. I never even thought about the fact that there was still another donut. For yearsssssss I would have obsessed over that donut until I would have just given in and eaten it. And today I ignored it as if it weren’t even there. Cause it might as well have not been there. I had already decided that I was only going to have half and that God would find honor and joy in the fact that I didn’t HAVE TO have the food just because I COULD. How far He has brought me. I suppose I have learned a bit from God and He has renewed me enough this year to know that it would be foolish to return to the same habits. But more importantly, this is something I have to say only God could do for me. You see, I “knew” all of this before in my mind. I “knew” I shouldn’t overeat. I “knew” I shouldn’t eat pounds of sugar. I “knew” I shouldn’t eat when I wasn’t hungry. I “knew” I shouldn’t eat what I wasn’t craving. But it took God to renew my heart so that it wasn’t just my mind that knew those things but also my heart and soul. Day 16 of my hard-core Daniel Fast. So, even though I don’t weigh myself, like I was saying the other day… I still have sizes that tell me if I’m losing weight or not. And lately, it’s been a bit slower than it was at the beginning. I know that’s because I’m so much closer to my ideal weight than I was in January (thank you, Jesus), but I also know that there is still some extra lovin’ hanging around on me. I am hanging around a loose 10 and a fitted 8. And I’ve been there for most of the summer. Actually, I don’t think I’d have fit into an 8 at the beginning of the summer so I might have lost a bit. So lately, I have been really evaluating my eating to see if that is an indication of why I am sorta at a plateau. Again, it might just be that my body is finding homeostasis like I talked about on day 115, and I’m cool with that. Well, honestly, even as I write “I am cool with that”… in my heart, I’m not “cool with that”. I want to be skinny. I want to wear a size six. I want my body to be admired, envied, coveted. Are my desires in the right spot? No. But those are my real desires. Godly or not. That’s where my mind wants to go. And that is the entire point of this covenant: to be transformed. to be renewed. to be changed. on the inside. Perhaps the outside of me will be transformed, renewed, changed, but the purpose is to allow God to do all those things to my soul. Okay, but honestly that was a bit of a divergence from my original topic! Ha! Got a bit carried away by the good ol’ Holy Spirit! I was talking with my covenant companion, Christy, the other day and she mentioned that she is no longer eating after 7:00pm. I just kept thinking about that. Cause you know what they say, “Nothing good happens after… 7pm!” Right?!?! Haha! But seriously, there is very rarely any purposeful eating after 7pm. It’s usually tied to some other feeling or emotion. There are a bunch it could be. But whatever the reason, I often find myself snacking during those late evening hours. It’s a bit like my afternoon hot spot that I talked about the other day. So, I decided that I’d give the no-eating-after-7pm thing a go. Wowsers. It was one of the hardest thing I’ve done since the beginning of my covenant! But that was a great sign that I had found yet another snackie hot spot like I discovered a few days ago that needed some fixing! So, we’ll see in a few days if I’m still as impressed with the “After 7pm Fast” as much as I was last night! Yesterday I was looking at my post number: Day Forty-Eight. I was thinking- wow… 48 days is a long time. I’m really pretty far along. So I figured that I would calculate how many days I had left. Three. hundred. and. eight. days. left. Yikes. The 48 days accomplished was way better. Haha! I am essentially only half-way through being one-third of the way through. But, it was kind of nice knowing that I have had so much personal growth and success and I’m only halfway through being one-third of the way through. It’s kind of fun to imagine how much more growth and success will happen during the rest of the “one third”! And this thought brought to mind these verses. Well, it actually just made me think of verse 17, but when I reread the chapter I had to copy more than just that one verse! Plus verses 8 and 9 are my all time favorite verses! We now have this light shining in our hearts, but we ourselves are like fragile clay jars containing this great treasure. This makes it clear that our great power is from God, not from ourselves. We are pressed on every side by troubles, but we are not crushed. We are perplexed, but not driven to despair. We are hunted down, but never abandoned by God. We get knocked down, but we are not destroyed. Through suffering, our bodies continue to share in the death of Jesus so that the life of Jesus may also be seen in our bodies. That is why we never give up. Though our bodies are dying, our spirits are being renewed every day. For our present troubles are small and won’t last very long. Yet they produce for us a glory that vastly outweighs them and will last forever! So we don’t look at the troubles we can see now; rather, we fix our gaze on things that cannot be seen. For the things we see now will soon be gone, but the things we cannot see will last forever.